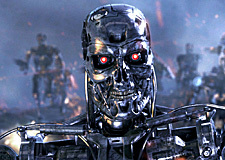 Following recent word that “Game of Thrones” and Thor: The Dark World helmer Alan Taylor is set to direct the Terminator reboot, Paramount Pictures, Skydance Productions and Annapurna Pictures have shifted the film’s release date by one week. Originally planned to hit theaters on June 26, 2015, the film will now grace the big screen on July 1, 2015. The new date puts Terminator up against 20th Century Fox’s Independence Day 2 and a still-untitled Illumination Entertainment animated film.